I was recently gifted some new nail art bits and pieces to play with, being neon multi shape and colour studs and nail vinyls. I thought I would combine them into a mani and this is what I created. My index finger is a reverse stamped decal. 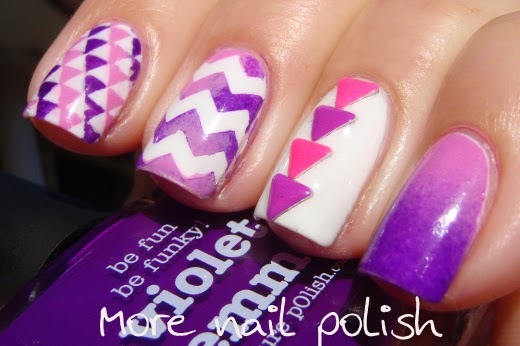 My middle finger was a white base with zigzag nail vinyls and sponged with pink and purple. My ring has pink and purple neon triangle studs and my pinky and thumb have a pink to purple gradient. The two polishes I used were Picture Polish Violet Femme and Candy. I have to say that after using the nail vinyls twice now, I'm completely in love with them. They are so different to using sticky tape. The vinyls are sticky, but peel off easily and they create such perfectly sharp edges. They are also thicker than tape, but soft and bendy so they curl around your nails nicely but are nice and strong when you pull them off. I jumped on their site earlier today and purchased some of the other unique shapes that I don't have. Nail Vinyls are available from http://nailvinyls.storenvy.com/. Nail vinlys seems brilliant - I'll order some straight away! :-) Thanks for the tip! 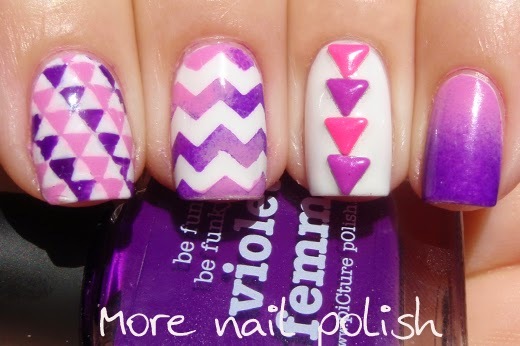 It's a fun nail art. Super cute! 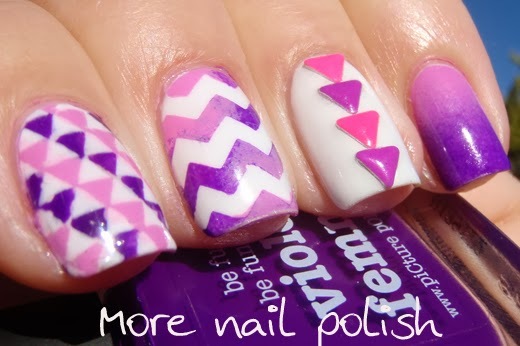 I really love the sponged zigzag nail, and I'm definitely going to have to get some of those nail vinyls. 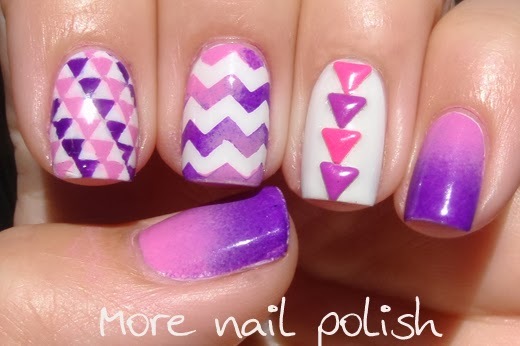 This is such a pretty nail art!